If, like the We Are Chester team, you are a fan of classic Hollywood musicals then you should definitely head on down to Storyhouse this February to see what’s on offer courtesy of Chester Operatic Society. The Society will become the first amateur company in the city to put on a full-scale performance on the theatre’s main stage with their production of the 1952 American musical comedy Singin’ in the Rain. Set in 1920s Hollywood, this light-hearted comedy focuses on the trials and tribulations of silent film actor Don Lockwood and his leading lady Lina Lamont during the transition from silent pictures to the early days of the talkies as they attempt to make their first “all singin’, all dancin” movie, things don’t quite go according to plan. Featuring songs such as Good Morning and Make ‘Em Laugh, as well as the iconic title number made famous by the legendary Gene Kelly who choreographed the dance routines in the original award-winning film, Chester Operatic Society’s production promises spectacular dance numbers and a ‘curtain of water’ on the Storyhouse stage. With umbrellas at the ready, We Are Chester will be jumping in and out of the puddles to bring you our own review of this show very soon. 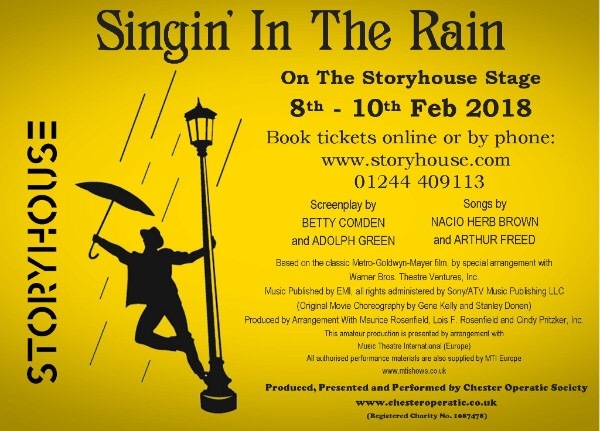 Chester Operatic Society’s production of Singin’ in the Rain runs at Storyhouse from Thursday 8 to Saturday 10 February.